People are drawn to the PowerMate for one of two reasons. Either they love the functionality or they love the "throbbing knob." I have to admit that I was drawn first by the pulsing blue light and the sleek retro-metal look but needed to justify the purchase with some type of required functionality. The basic function of the PowerMate is to control your system volume. Not enough functionality excuse for me as I have volume control buttons on my Apple keyboard, so I searched for something beyond mere volume control. I asked Snaggy (from the Joy of Tech) to try some possibilities out with his PowerMate before I could run off to the local Apple Store. I wanted the PowerMate to control iTunes in the background while I played Warcraft3. Was it up to the challenge? Snaggy and I went back and forth with ideas and finally found that Keyboard Maestro would let us map unused key combinations to background tasks. Combining Keyboard Maestro with the PowerMate controller, we had the PowerMate emulating the keyboard combinations and Keyboard Maestro sending the commands to iTunes. I had found my excuse (reason) for getting a PowerMate and ran over to the Apple Store. An hour later I returned to my geekosphere and installed the sleek aluminum version (they are offering Black Limited Edition, but the aluminum goes great with Apple acrylic). I had my configuration matching Snaggy's in about 20 minutes. The configuration for the PowerMate allows settings for click, long click, dial right, dial left, click/dial right and click/dial left. It is quite versatile. 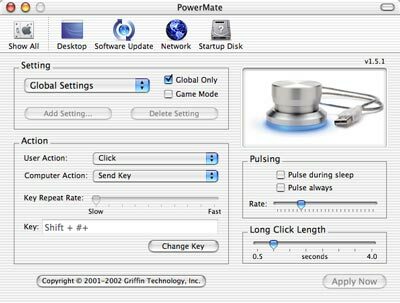 I used global settings, but you can also configure the PowerMate's actions to do different things in different applications. Now, I play Warcraft3 and simply reach over with my pinky finger to control volume, skip to a random song or skip to the next song all with the PowerMate. I give it 4.5 out of 5 geek heads. One more half geekhead when Griffin eliminates the need for Keyboard Maestro. 4.5 Geeks out of 5 Geeks! Kevin's Tip #1: Use KM to setup unused keyboard maps to control itunes, then setup the throbber to emulate those keyboard maps..... then i have background control of itunes. Tip #2: set the throbber on top of the Cube for eerie midnight effects. "it gives the impression of living in a cheap motel downtown with annoying neon light outside the window.... very retro-urban." Oh, did I mention the pulsing? Its adjustable and I put the PowerMate on top of my cube for an added eerie effect. Third party developers are creating other uses, such as Unsanity's CPU monitor which pulses the PowerMate to reflect CPU usage on your system. 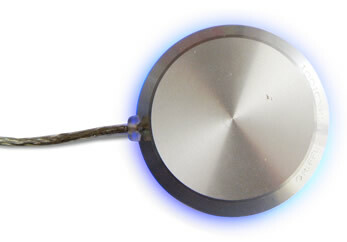 I look forward to someone pulsing the PowerMate quickly when new email arrives at a popmail account. Anyone? 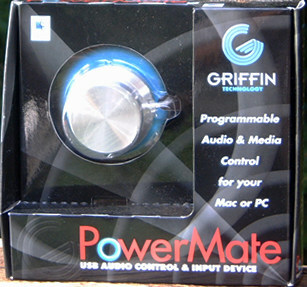 The Powermate is available for $45.00 at a number of online retailers, including the Griffin Technology website. 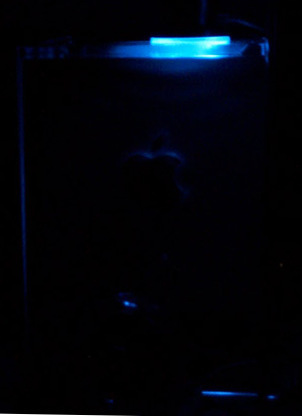 Eerie glow on the cube!